Whether halfway around the world or in my own backyard, I strive to capture a strong sense of place in my work. Most often we associate “sense of place” with images of indigenous people living close to the land, but this sensibility can be extended to incorporate the local natural surroundings into any creative images. As I collaborate with local people close to my home in the San Francisco Bay Area, I’m always seeking ways to integrate the intense beauty of our landscapes into my work. 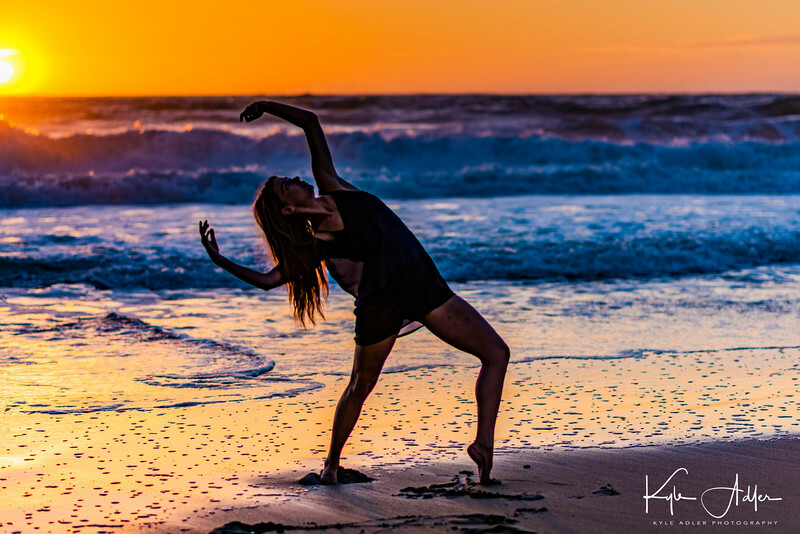 Today’s post is a case study on this theme based on a recent shoot I did with a favorite movement practitioner, mia. 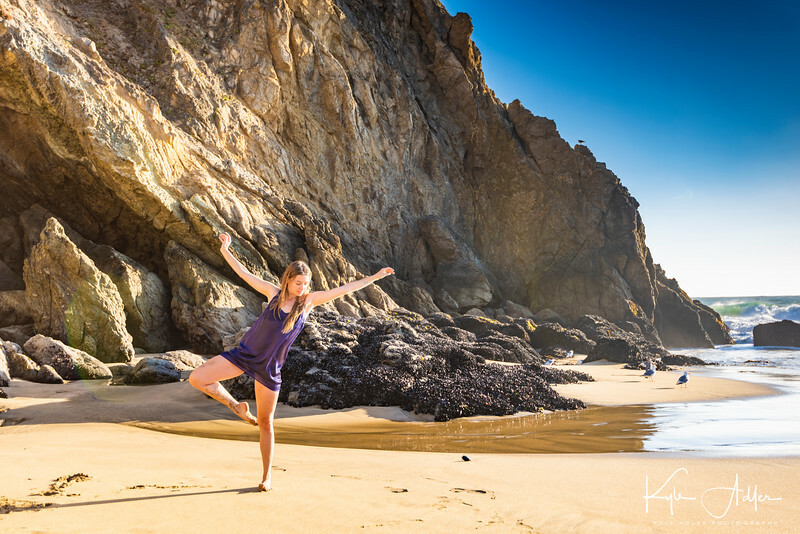 mia is an amazingly intuitive artist who improvises her movement by sensing the energy of the space around her, so we chose a glorious and deserted stretch of the central California coastline near sunset for our shoot. We built in plenty of time, more than two hours, and I gave mia lots of space to move with very little direction on my part. 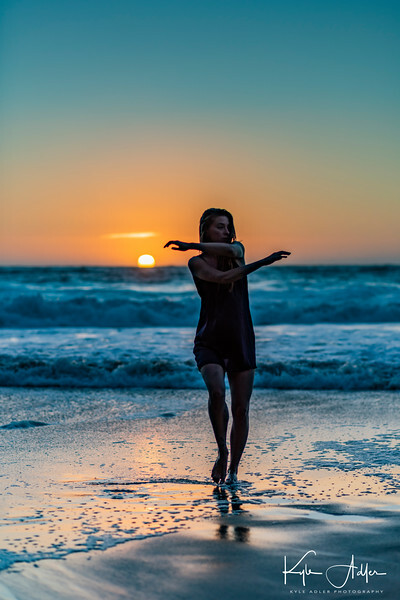 I had all my gear ready and was wearing beach attire myself so I could just let her create her art while following her and capturing her expressive movement using my own creative approach. In the following images, presented as a photo essay with just brief captions explaining how they were made, I share the results of this collaboration. You can view or purchase all of these images and many more in this gallery: mia beach shoot photo gallery. My gear was simple: two camera bodies, one with a fast prime normal lens (and occasionally with a fast prime portrait lens), the other with a wide-angle zoom lens. Obviously, these optics were selected so that I could alternate between capturing mia up close and documenting her motion within the broader environment. All images were made with natural light only and were handheld. A general piece of advice is to shoot lots of frames to ensure capturing your model during the moments when they express just the right sensibility, gesture, or emotion. Memory card storage space is cheap and abundant, so always shoot more images than you think you need. Using the wide-angle lens, I captured images of mia interacting with the space around her. This “environmental portrait” technique helps create a strong sense of place. 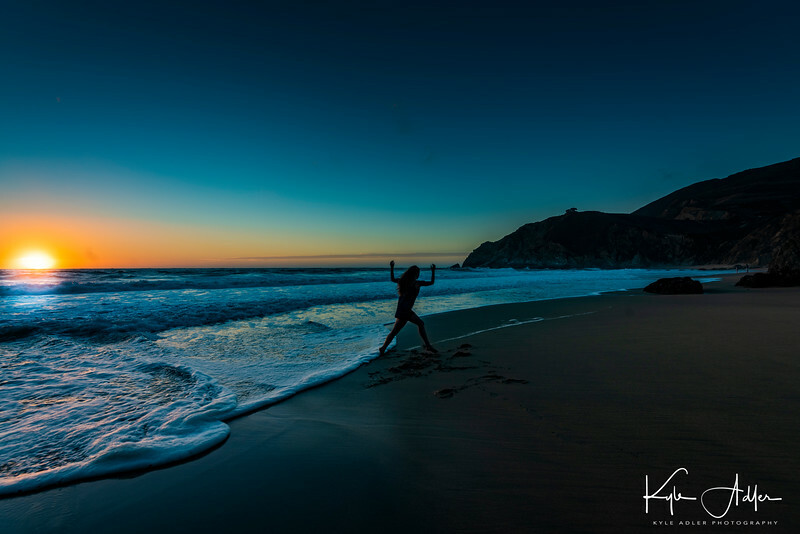 Even with the glorious color palette of a California coastline near sunset, there were times I chose to render the images in black-and-white to achieve a timeless graphics art look. Environmental portraits, full-body shots, and head shots are not the only options when shooting creative portraits. 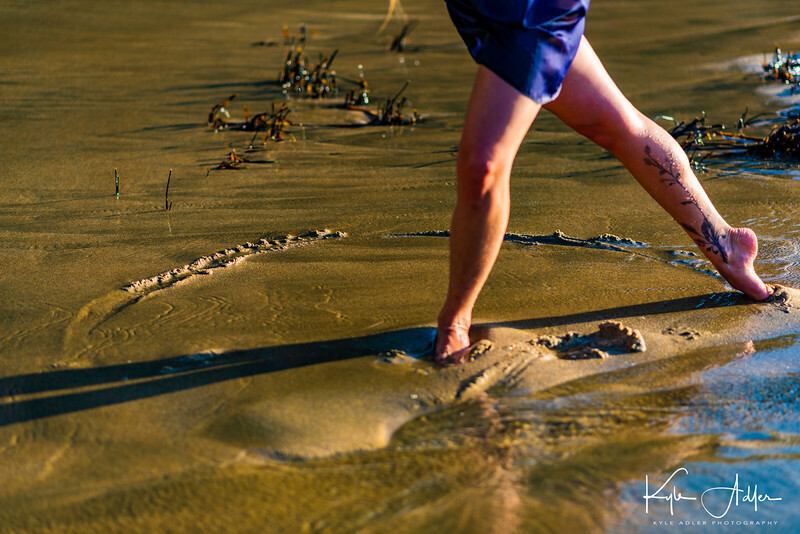 Here I chose to capture only mia’s legs as she traced a circle in the wet sand. Sometimes the part can be more interesting than the whole. Shooting from a low angle just above the water, I captured a powerful vision of mia interacting with the ocean. Obviously one has to be careful of one’s gear when choosing to shoot so close to salt water, but I love the resulting image made from this perspective. Not every image needs to be tack sharp. 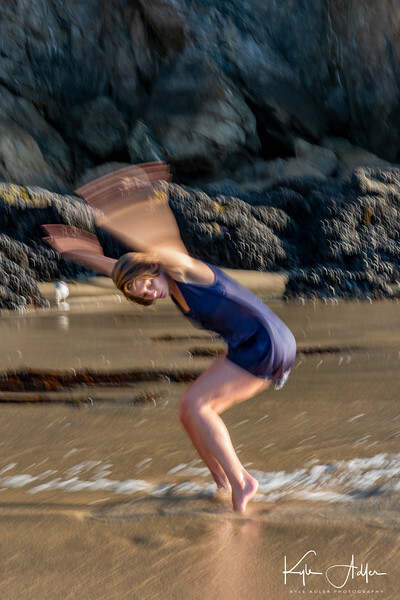 I like to create a sense of motion by using a slow shutter speed to blur the movement. Here I was able to achieve a slow enough shutter speed by using my camera’s slowest native ISO setting along with a very small aperture setting, but sometimes in very bright light a neutral density filter has to be used. 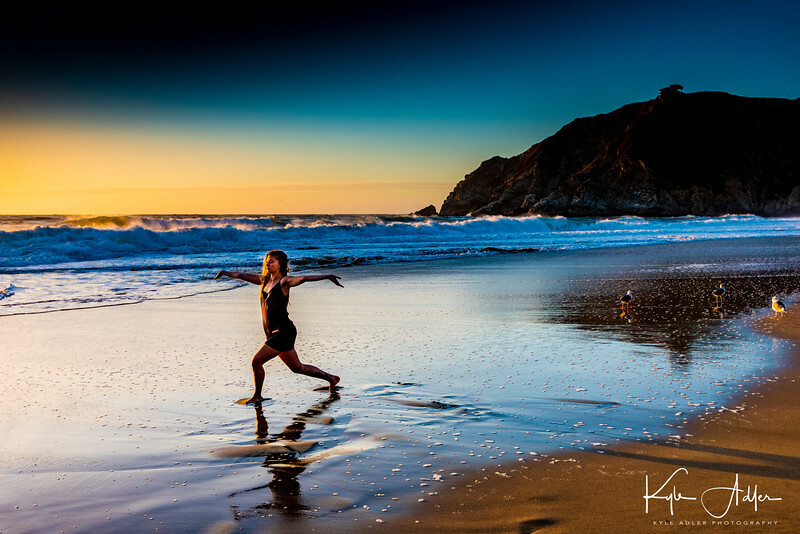 Note that when shooting a backlit subject it is crucial to choose an exposure based on the light coming from the model rather than allowing your camera’s meter to choose the exposure for you (unless you are trying to create a silhouette). Two techniques suitable for this situation are spot-metering on your subject’s body or dialing in at least two stops of exposure compensation. As sunset approached, I shot a series of images using both wide-angle and closeup perspectives. This shot nicely captures mia from a medium distance, close enough to see some detail in her expression while far enough away to include some sense of place. The setting sun can evoke very powerful emotions. It can be risky to include the sun in your images, so tread carefully. Careless shooting into the sun can cause permanent damage to both the photographer’s eyes and the camera’s sensor. This image was made moments before sunset under conditions I assessed to be safe, but if in doubt do not ever shoot into the sun. A wide-angle capture suggests mia’s celebratory motion as the sun sets, but she appears relatively small within this awe-inspiring natural environment. At the moment of sunset, a parting shot is made where mia bids farewell to the day. 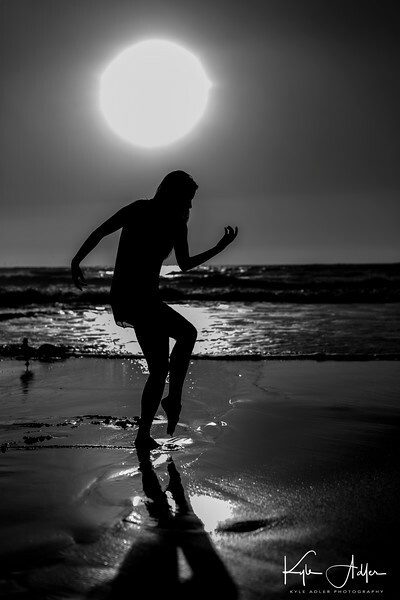 I chose an exposure partway between silhouette and spot-metering on mia’s body so as to show some detail on her expression while allowing the ocean and sky to shine. I hope you’ve found these images to be inspiring and the associated tips to be helpful. Now go out in your own neck of the woods make some images that integrate a sense of place into your favorite subjects! Do you have techniques you use to infuse your local images with a strong sense of place? Please share them here. Want to read more posts about what to shoot while near home or traveling? Find them all here: Posts about what to shoot.